Price does not include airfare, meals, or alcohol. It’s surprising how many people don’t know how gorgeous the coasts of Spain and Portugal are! It’s not just the weather and the sand and the sun. It’s also the tidepools, the islands, the rocky outcrops, the cliffs, the columns, the blowholes, the waterfalls, the caves, and the arches. Some of these fabulous forms have to be seen to be believed, which just adds to the many reasons this region of the world is a must see. The wine is world class! The food is delicious! Focusing on the ocean at sunrise and sunset, we’ll share a wonderful journey starting in Bilbao and stopping by Altamira and Santago de Compostella before arriving in Lagos. Plus, you’ll see it through each other’s eyes in our frequent seminars. 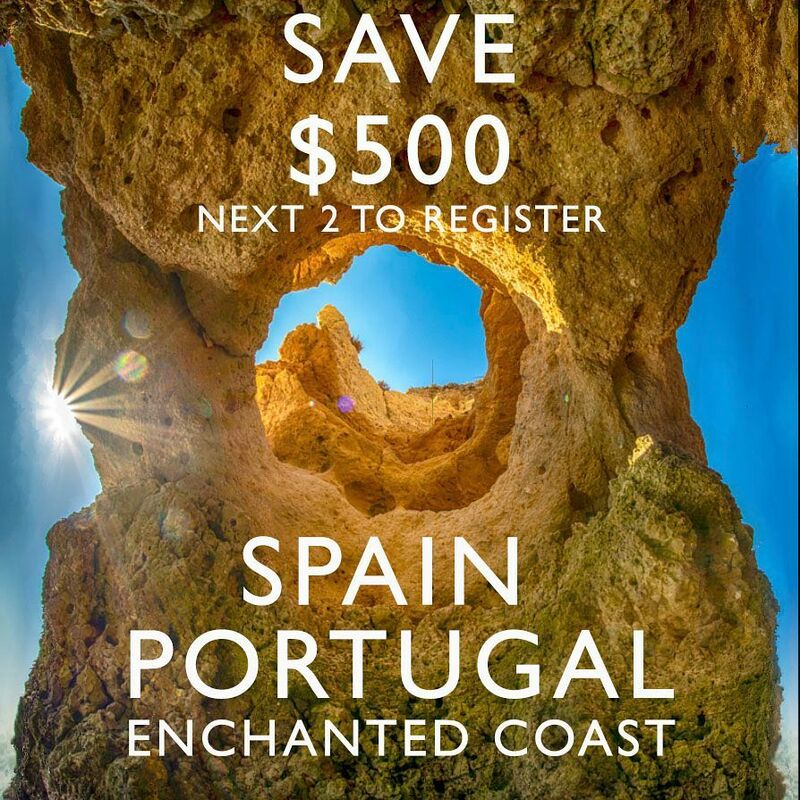 We strongly recommend spending extra time before and/or after the workshop to explore Spain and Portugal’s magnificent history in cities like Madrid, Barcelona, Granada, Toledo, Cordoba, and Lisbon. .Day 2 – BILBAO Sunrise at Zumaya BeachSeminarSunset at Barrika beach. .Day 3 – BILBAO – CudilleroSunrise at Playa De ArniaVisit the Altamira Museum (prehistoric cave paintings)Sunset at Playa De Campiecho . .Day 4 – CudilleroSunrise at Playa De Las CatedralesSeminarSunset at Playa de Gueirúa .Day 5 –Cudillero To RibadeoSunrise at Playa de PortizueloSeminarSunset at Playa De Las Catedrales . .Day 6 – Ribadeo to PortoVisit Santiago De CompostellaVisit Porto . Day 7 – Porto to LagosVisit PortoOne On One ReviewsAfternoon Ponte De Piedade, Lagos . .Day 8 – LagosSunrise boat cruise of Lagos coastlineSeminarSunset boat cruise of Lagos coastline . .Day 09 – LagosSunrise boat cruise of Lagos coastlineSeminarAfternoon Playa De Mirinha.